I love this picture that I snapped at a NASCAR Whelen Southern Modified Tour Race several years ago inside of one of the haulers. It was a picture of a white board, with a simple set of instructions on it. 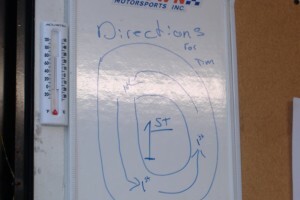 In the middle of the board was a large oval diagram, obviously that of a racetrack. 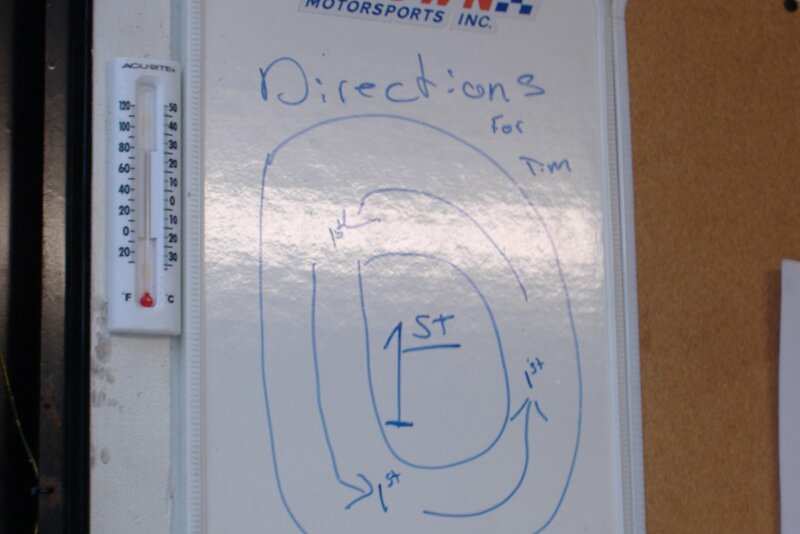 Around the oval were three arrows circling counter-clockwise with “1st” wrote in between each of the arrows. In the middle of the oval drawing was also “1st”. Thinking about this diagram brought another ‘path to victory’ to mind. I recall Luke 10:25-27 when Jesus was asked about getting to Heaven, more specifically what he needed to do to gain eternal life. Jesus answered Him, “Love the Lord your God with all your heart, soul, strength and mind” and “love others as you love yourself”. What a simple guide. Love God with everything we are, and love others as we love ourselves. Our faith can become quite intricate, and many discussions could be had on the topic of salvation, and what it ‘takes’ to be saved…and I am not discounting all that salvation entails. However what better way to sum it all up into a two-sentance guide to victory. If we love God with all of our heart, soul, strength and mind we will obey Him and what He speaks to us through scripture. Not because we have to, rather because we love Him so much that we want to. If we loved others as we love ourselves, we would share that same hope that we find in Jesus Christ with everyone we come in contact with. In doing both, we fulfill God’s comission in our lives. The sure-fire path to victory.